It’s been a while since the last post, so let me catch you up a bit. Since coming home last October, our bicycles have been sitting in pieces in the shed, almost forgotten as city life slowly tries to dim the impressions and images from our 16 months on the road. Perhaps they’ve been resting after carrying us for nearly 20,000 kilometres through Europe, Oman and South America. Jan and I both bought used bikes for our day-to-day needs around town. Our Rodriguez UTBs are far too expensive to use in a city where, like in most cities, bicycle theft eventually touches every cyclist. But with spring warmly upon us the time had come to dust of the disassembled frames and rebuild them because the road beckons. Rodriguez Cycles in Seattle kindly repaired our broken rack mounts, redesigning them to make that part of the frame stronger and not likely to break again. 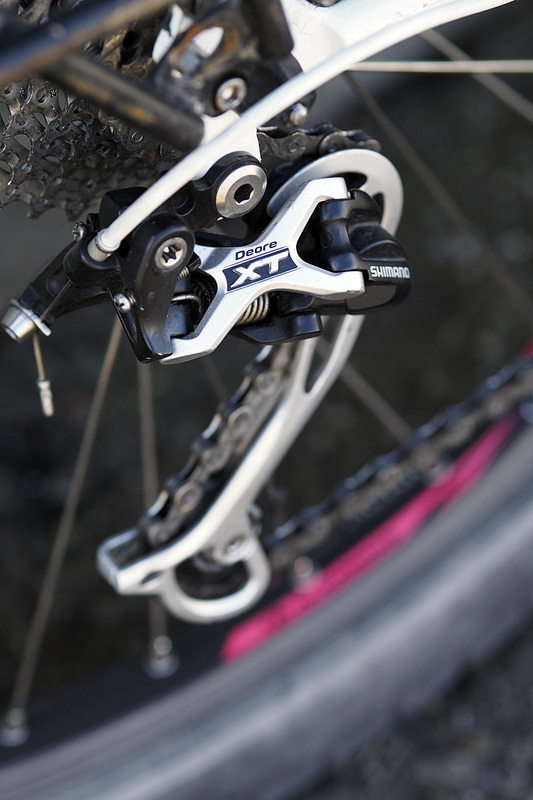 Instead of two separate braze-ons, Rodriguez redesigned the drop outs. Our transmissions were completely worn out and in need of an upgrade. We rode our tour with a 3×8 speed set up that served us very well but we’ve decided to go to a 3×9 speed. 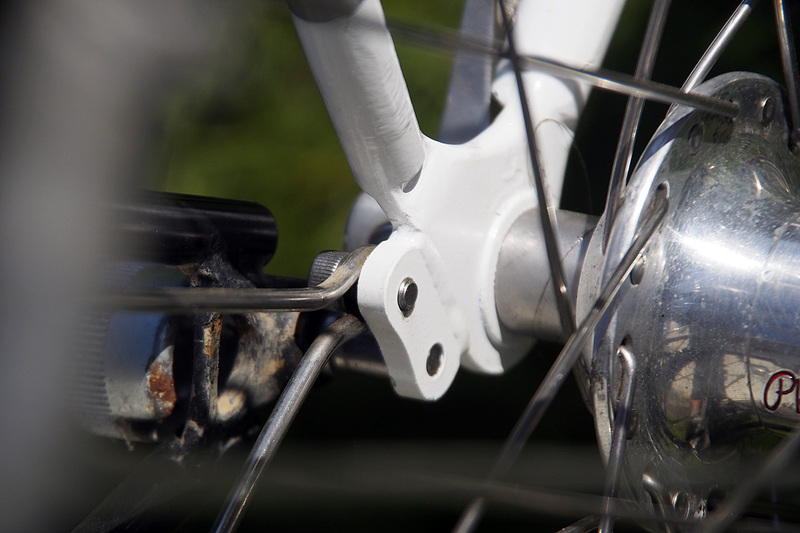 We also had our Phil Wood rear hubs rebuilt under warranty and they were laced into our old front rims that have languished in the shed after we had new front wheels built with Schmidt Son 28 dynamo hubs two years ago. 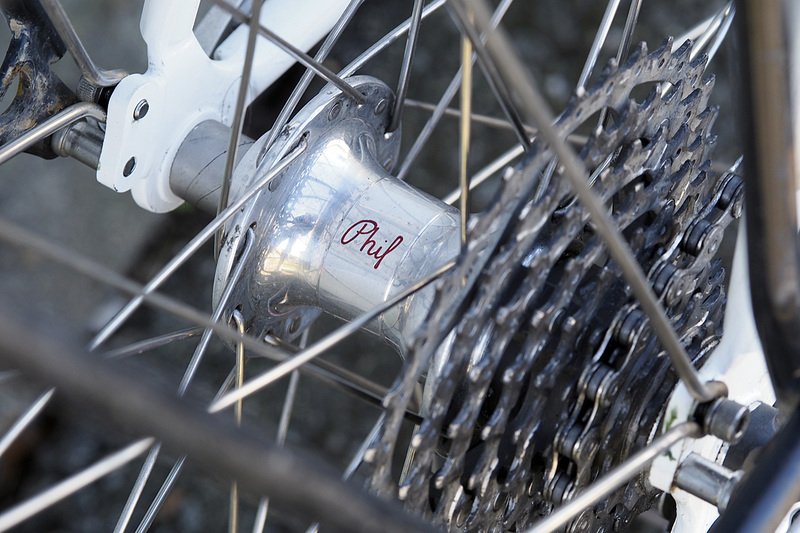 Phil Wood rebuilt our failed rear hubs under warranty. During the winter, I scoured Craigslist for bike parts and found a set of Shimano XT MTB components suitable for my bicycle. They were slightly used, but in good condition and I got them for a good price. 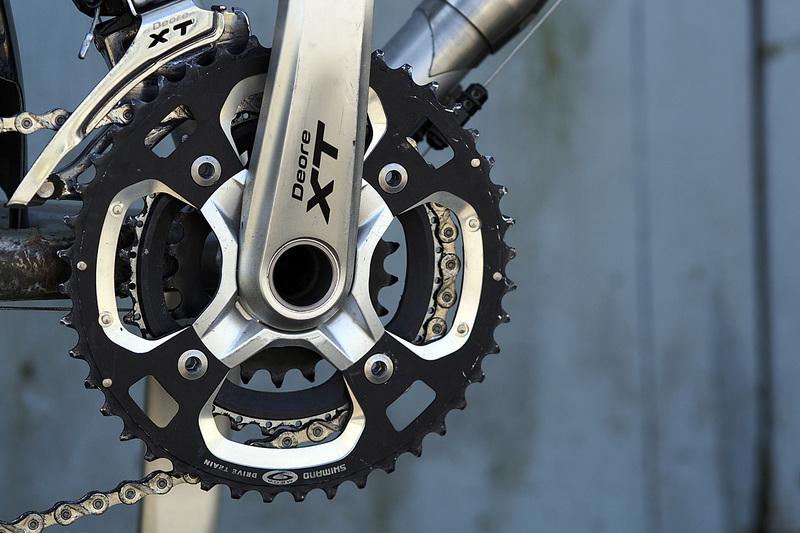 XT long cage rear derailleur. 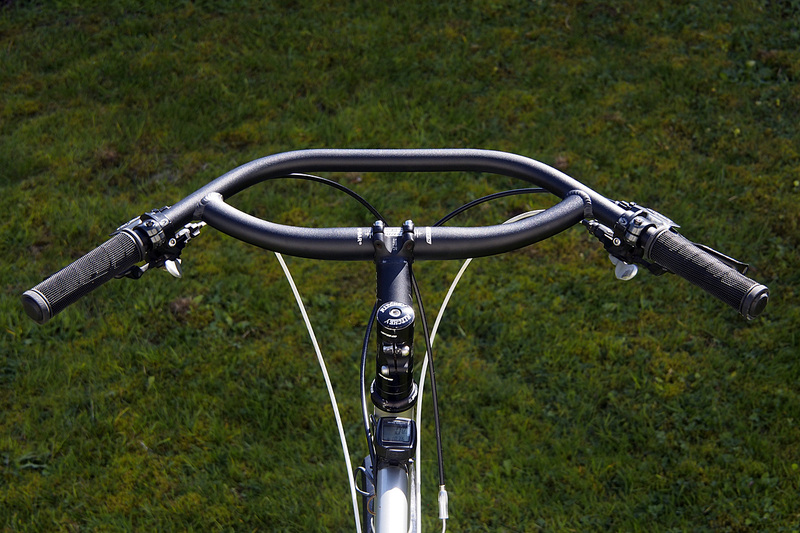 I had also been thinking about changing from drop bars to a flat bar. I have always liked the multiple hand positions a drop bar offers but in reality, I used the drops less than five per cent of the time and packing them was always a hassle because of their shape. But which bar would be a good one for touring? I finally settled on the Jones Loop H-Bar. An expensive but well thought out piece of equipment offering a wide, stable platform with multiple hand positions and space to mount all kinds of gadgets such as GPS, phone, light, map or bags. It’s also compatible with many kinds of shifters. A new, wide and stable platform with multiple hand positions. The Schwalbe tires are still good to go, even after 30,000 km on our front Marathons and nearly 20,000 km on my rear Mondial. I love their durability and despite their high mileage, I will keep them on the bike for now. 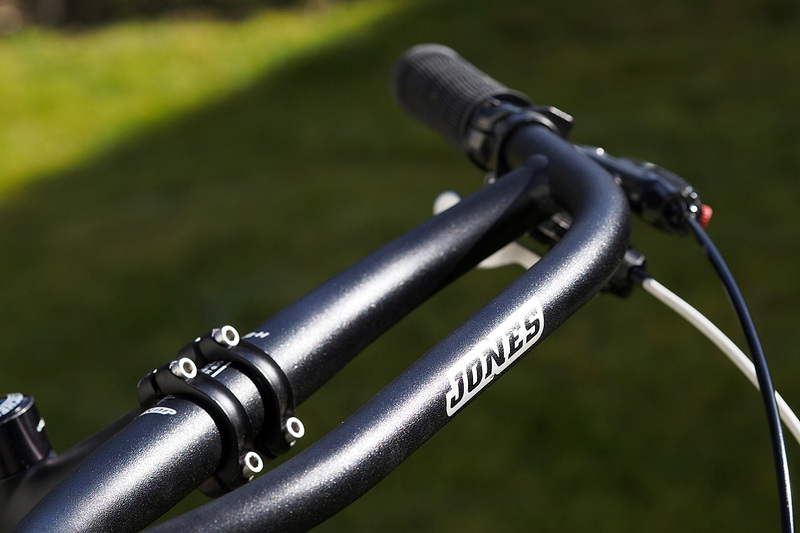 My bicycle now looks very different with the wide, sweeping Jones bar and thumb shifters. The gearing ratio is also different as I’ve opted for a 22-34-46 crank to provide a lower gear for climbing than the 24-36-48 set-up I had before. I’m still experimenting a bit with the position of the bar. I will likely change the stem to one with a shallower angle than the current one to improve my position on the bike. I like being fairly upright as it’s less fatiguing than a more forward position but with the angled stem I’m a bit too upright and my weight is a bit further back than I like it. Time will tell if I like the changes I’ve made. Only hours in the saddle can determine that. But I liked the way it felt when I rode out to one of the suburbs last week for a meeting. It was a 60 km round trip on a route I deliberately chose for its varied terrain to have some steep climbs, including a 1.5 km, 15% hill to test the legs and the new gearing configuration. So far, so good. Earlier this week, I added another bicycle to the stable. More on that later. Getting ready for our meet up! Good job! nice bike! I would love to see it in action. I had no idea bikes were that complex and interesting. Hi Herb, Thanks for following the blog. I like the Jones bar. It’s a comfortable cockpit with lots of room for attaching stuff like a gps, odometer, etc. The various hand positions are key to relieve fatigue and stress from long hours on the bike. The drop bars did that for me but I found I almost never used the drops any more so some kind of flat bar was a natural choice. The other nice feature is that I can sit completely upright and still keep a hand on the bar. Sitting up can relieve fatigue in the back, hips and neck. Hope this helps. It’s an expensive bar but a good piece of equipment. I have a similar bar on my other bike. Blog post to follow soon on the build of that one. Herb, I did already tour on the ECR. Look for a couple of posts from 2015. 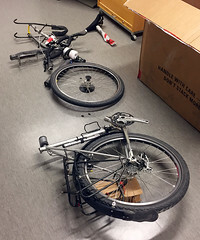 I’ve just had new wheels built for the ECR, the rear with a Rohloff hub and the possibility to run a 3″ tire or something a bit smaller and smoother for mostly pavement. 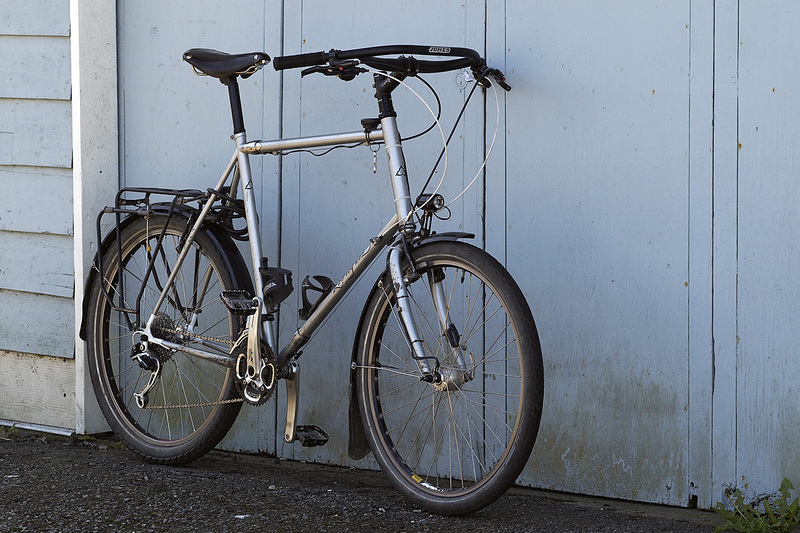 The Surly Knard tires actually perform pretty well on pavement. Much better than I had hoped. Pumped up to 35 psi, they offer a pretty smooth but somewhat noisy (on downhill) ride.